Iranian couples get married in Antalya to have their dream weddings as part of the wedding tourism which becomes a trend in the world. Iranians, who usually prefer 5 star hotels and beaches, attract attention with their traditional weddings. Pharmacist groom Hanif and dentist bride Azadeh Vali came to Antalya with their 50 close relatives through international wedding organizer Wedding City Antalya and get married with a religious marriage ceremony after their 5 year relationship in a 5 star hotel in Kundu Tourism region. Before the religious ceremony which is called ‘’Sofreh’’, walnuts, wheat, onion, garlic and radish was placed to the bridal table as a tradition. The Sofreh table was decorated with fresh flowers, crystal and glass vases and special accessories. Moreover, the table was decorated with silver candle holders, accessories and plates because of the belief on protection from the bad luck and negativities. Wedding City Antalya organization company also put Turkish delights and Turkish baklava on the table. Bride and groom also brought special traditional Iranian food and honey and made each other eat these things with their hands as a tradition. It is believed that this tradition will bring happiness to the newlywed couple. After religious ceremony which is held by an Iranian religious man’s prayers, Iranian wedding couple released white doves and entertain with their relatives and friends. Azadeh Vali said that Antalya is a great city for getting married and the weather condition of Antalya and its people’s hospitality is very nice. She also mentioned that she and her husband always wanted to make their wedding at somewhere green and blue with sea and natural beauties and during the research for a country to get married Vali said that they saw a video on the web which shows a wedding in turkey and they liked the video so much. Afterwards they made some researches on Antalya they decided that the city is heaven on earth. General manager of the international wedding operator Wedding City Antalya Company Gulseren Ozdemir stated that ‘’although Russia, Europe and surroundings was in the first place in wedding tourism, recent years Iran and India come into prominence. Especially Iranian couples have a great interest in Turkey, they embrace Antalya. They want to have a nice holiday, swim in the sea and shop as they wish. Most Iranian families are living in foreign countries. They gather in their most favorable country, turkey, for their weddings. Iranian young people who live in foreign countries as UK, Canada or Europe prefer to get married in Turkey as their families can come to turkey without visa problems and moreover turkey is always more economical than the countries they are living in so they meet with their families in the middle point, turkey. This situation has a big advantage for Turkey, Antalya tourism, this is why we should care and improve Iranian wedding tourism. Iranian families come at least with 50 wedding guests and these weddings are very important especially for the winter months which is called off-season. The marriage requests from Iran increases day by day. 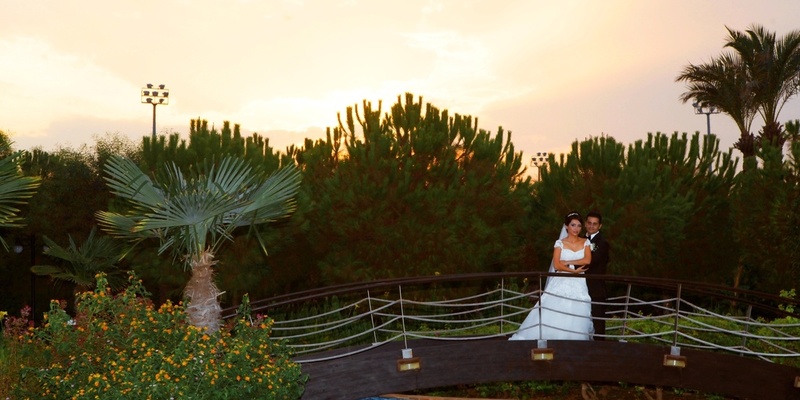 The aim of our company is to increase Iranian and Indian weddings in Antalya. The couple which was planning their marriage ceremony and could not make a choice between Greece and Turkey saw the wedding organizer Wedding City Antalya Company’s wedding package about the Side Apollon Temple on company web page and fell in love with the wedding package. Yelena Reinstein and William Scott Owens decided to get married in Antalya after they saw the pictures of Apollon temple and read the text above. The FBI employee couple said YES to each other with Cleopatra and Caesar costumes among the historical Rome ruins during sunset. During their marriage ceremony in front of the Apollon Temple which is made on AC 150 they released 2 white doves as a symbol of happiness and they wished happiness to each other. The couple was very attracted by the horseman police soldiers and took a memorial photo with them as they have a gorgeous visual. The couple had their wedding dinner reception with their families at Side Moonlight Restaurant with an incredible sea view on the terrace which is prepared exclusively for them by Wedding City Antalya. The wedding cake was with American and Turkish flags as a symbol of friendship of two countries and classical guitar and violin was played during the wedding cake ceremony. This wedding was the second most important wedding in wedding tourism after the International Saint Nicholas Wedding Festival. The introduction of the wedding was very important with the support of Culture and Tourism Ministry and Side Municipality. Gulseren Ozdemir, general manager of Wedding City Antalya Company which is a wedding operator in Antalya said that ‘’Antalya is a candidate to be the wedding city of the world with its natural beauty, incredible hotels and historical cultural places. We believe that Antalya will take the place it deserves with the support of our Culture Tourism Ministry and concerned authorities. Norwegian couple Alexander Myhre and Taj Erene Larsen get married again with a symbolic marriage in Antalya Aquarium. They attended the symbolic marriage ceremony with pirate costumes. After the ceremony wedding group had a tour in Aquarium and attracted by different kind of fishes in it. Norwegian bride Taj was in the center of attraction. She swim in the aquarium pool with dolphins with their bridal dress on her. It was an incredible show as the couple owns a farm in their own country and knows about animal psychology. Bride swim with the dolphin for hours and it was impossible not to impress by this beautiful scene. Kazakh groom Ferdi and Russian bride Alexandra got married in Antalya Aquarium with an organization of international wedding operator wedding city Antalya. The couple’s marriage ceremony was held in Aquarium with underwater visions and sharks around. Wedding couple had a romantic wedding renewal, took lots of photos and lived and unforgettable day with their wedding guests.